Hey, it's almost Valentine's Day! 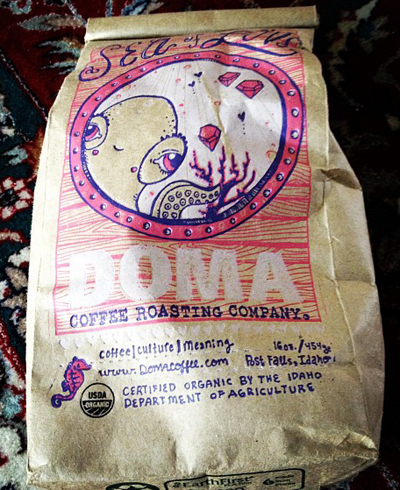 And when we want to enjoy a warm, loving beverage, we don't look much further than DOMA's Sea of Love. After drinking a lot of Kenyan and Ethiopian coffee lately, AeroPressed, it's almost a bit strange going back to a French Pressed Colombian, but that's where Sea of Love took us, and it almost felt like a homecoming of sorts. There is just something familiar with the flavor, and we mean that in the best way. We found the beans to have a mellow, sweet scent with a nice hint of chocolate toward the back. A sip instantly reveals this to be be Valentine-y. Here we have something close to chocolate covered cherries, with just a bit of caramel mixed in. Imagine if Hershey's actually used quality ingredients in a subtle way, and you might kind of get the idea. Kind of. The body here is smooth, almost velvet like, and the aforementioned caramel lingers after each sip. Sea of Love might not be a flavor bomb, and that is perfectly fine. Instead it's a very pleasant, relaxing cup of coffee, smooth and subtle, not unlike a post-Doobies Michael McDonald. I dare you not to hum "I Keep Forgettin'" while enjoying a cup. Bonus: Read artist Tiffany Patterson's blog post about the printing the Sea of Love bags. Do you recommend DOMA Sea of Love? Make your voice heard!